Here's my new brake light switch that I couldn't install. I don't know, it was just a PIA. I couldn't push on it enough to seat the new one in the frame cut-out. I re-installed my old one OK, which makes me wonder if the new one had a poor plastic casting that was the reason it wouldn't seat. I took the new "non useable" switch apart and inspected the insides. Just contacts and springs... that's it. If you want, you could remove the cover on your old one and emery cloth the contacts and probably fix it and keep it going for 7 more years. YMMV. Below, all I needed was a small screwdriver to open the new brake switch. Hey, what do I do with that little collar on the plunger? It's white on the new switch (top), and red on my original switch (bottom). John, from time to time I browse your site, and look for tidbits of useful (RR) and entertaining (beer cooler) information. I noticed a few pics of the brake light switch. Have you had trouble with yours. I had mine catch on fire a few months ago. It was a 'character building' experience for my truck. Well any way I thought you might enjoy this. 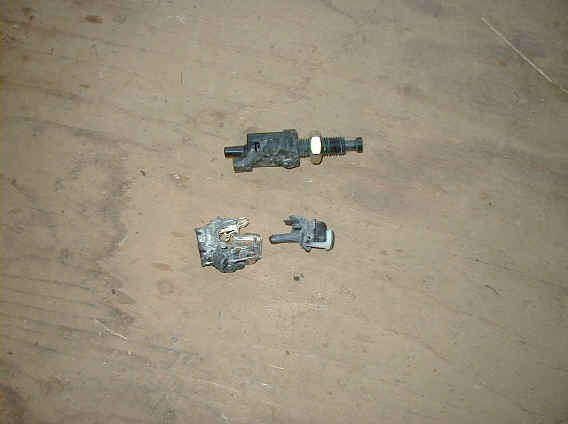 The upper switch is the cruse control brake switch, slightly melted, while the lower is the brake light switch. Now I have seen a recall for the brake light switch un a UK website, but as of yet I don't know if it is a North American recall. Its on my list of things to look into. Go to NAPA (my favorite source for after-market LR parts), and take your brake switch. There is a NAPA equivalent that screws right into the stock bracket, has an adjusting collar that is very easy to figure out, and it's CHEAP. Oh, did I mention it's CHEAP? I still have the one I bought years ago sitting in the '90 RRC I'm parting out. Lemme see if I can go get it tomorrow and send it to Jon so he can post it on his site.